of western coast, stretching an area of 97 sq km, on the border of Kerala and Tamil Nadu in the north where it extends as the Annamalai National Park. Indian Bison in Wayanad National Park in Kerala, in Karnataka and the Mudumalai - Bandipur reserves. 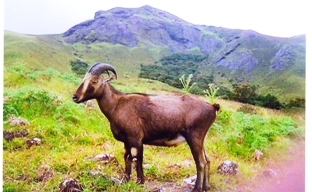 Nilgiri Tahr - Eravikulam National Park is the best place for this. The Park exhibits the breathtaking natural splendor of rolling grasslands and exotic flowers. Anamudi, the highest peak of south Himalayas, towers over the sanctuary in majestic pride. The enchanting Munnar Hill Station to this Park is just 15 kms away. This National Park is also home for Nilgirl Tahr, one of the endangered animals. In 1978, it was declared as a National Park . The Park is divided into 3 regions - the core area, the buffer area and the tourism area. Visitors are allowed only to the tourism area which is in the Rajamala region. Trekking facilities are available here. An estimated 700-800 Nilgiri Tahr inhabit this National Park, making it the largest wild population in the world. The Nilgiri Tahr generally inhabits the fringes of the grassy plateau and move on to the steep slabs and cliffs bordering it. They occasionally visit the Shrub Lands along the base of the cliffs. Tahr avoid Sholas, but sometime forage along their periphery. By Air: The nearest Airport is Cochin, 155 kms away. By Road: A motorable road is there up to Rajamalai, the park headquarter. From Rajamalai, one needs to travel on foot for around 18 kms. The distance from the enchanting Munnar Hill Station to this Park is just 17 kms.